Kaplan is a nurturing, creative and enriched learning community; where every child is encouraged and supported to progress at his/her own pace. We put special emphasis on healthy social and emotional development, while using a play-based approach to ensure that all children have the skills necessary to succeed in school. Half day option 9:00-12:00 with afternoon enrichment add-on 12:00-3:00. 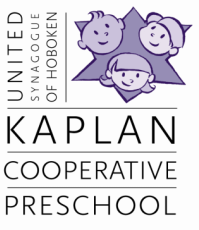 Caregiver and Me classes: Tot Shabbat at 3 locations around Hoboken plus 1 in Jersey City! * For children who are two by March 31st, class starts in September of the same year. For children who turn 2 between April and July, class starts in January of the next year. ** Enter anytime when your child turns two as space allows.